Democrats of all stripes have been celebrating the prospect that the pro-European centrist Emmanuel Macron—not the far-right National Front’s Marine Le Pen—will be France’s next president. But while Macron’s victory is good news, it does not augur the defeat of populism in Europe. On the contrary, Macron represents a kind of ‘enlightened populism’ that comes with its own set of problems. Macron’s candidacy, like Le Pen’s, was a rebuke to France’s mainstream political parties. He persuaded voters with his promise of a Scandinavian-style combination of economic liberalism and a flexible welfare state. But it may be time to concede that Scandinavia is unique, and programs that succeed there may not be replicable elsewhere. Nonetheless, Macron’s populism may not be altogether a bad thing in the short term. Perhaps, in France and elsewhere nowadays, only a populist can beat a populist. If so, Macron’s enlightened populism certainly is preferable to the nationalist populism that Le Pen espouses. The question is whether enlightened populism can play a role in steering political systems away from populism altogether—and toward real solutions to their countries’ problems. The only true antidote to populism—the only real way to resolve the problems that ordinary people are facing—is greater political globalization. After all, it is economic globalization without political globalization that produces nationalism. Populists promise to halt economic globalization; in reality, they can stop (or reverse) only political globalization. So the rise of populists to power creates a self-reinforcing dynamic, in which nationalism becomes increasingly salient. Yet, as Macron proves, not all populism need be nationalist. Historically, left-wing populism has been more common than its right-wing variant, the strength of which in the West nowadays reflects the perception, in the eyes of many citizens, that the left has become elitist. There is, therefore, a case to be made that populism can be taken back from the nationalists and used to advance European integration and political globalization. But, despite widespread enthusiasm about Macron’s victory, most of us remain subconscious fatalists on the matter of political globalization. Who today believes in global democracy, or even in the United States of Europe? Long before the current wave of nationalist populism, Europeans rejected a cautious European constitution. Compared to this earlier ambition, even the most daring of Macron’s proposals for eurozone integration is in fact a minor revision. German Chancellor Angela Merkel, after congratulating Macron, made clear that she will consider no fiscal-policy changes—a stance that precludes a common eurozone treasury. Past experience with enlightened populism reinforces this somewhat bleak perspective. Enlightened populism’s founding father was Donald Tusk, the former Polish prime minister who is now President of the European Council. Before he became Poland’s prime minister, Tusk, like Macron, left a mainstream party to establish his own popular movement, Civic Platform. And, like Macron’s En Marche !, that movement emphasized youth, optimism, and the promise of harnessing people’s talents and energies. As prime minister, Tusk would respond to questions about his political vision by quipping that anyone who experienced visions should go see a doctor. 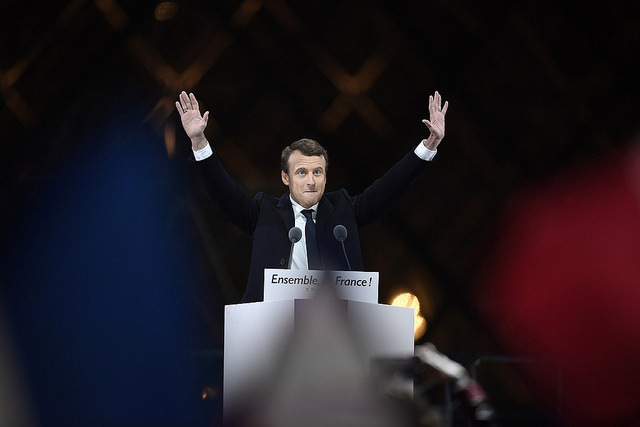 He selected people from both the left and the right to staff his government (an approach reflected in Macron’s claim that his brand of politics transcends the left-right divide). Tusk assembled a kaleidoscope of views and people, and he shook the kaleidoscope whenever there was a need for a new perspective. But Tusk, like Macron, faced a formidable challenge from nationalist populism, which in Poland came in the form of the Law and Justice (PiS) party, led by the late Lech Kaczyński and his twin brother Jarosław, who today is Poland’s de facto leader. Even after Tusk came to power, it was the Kaczyńskis who shaped the agenda and tone of Polish political debate. With Tusk forced to remain on the defensive, Polish politics came to consist of the PiS and the anti-PiS. Macron may find himself in a similar situation, characterized by three key risks. First, Le Pen—who, in her concession speech , called on ‘patriots’ to commit to ‘the decisive battle that lies ahead’—may continue to set the tone of the political debate. In that case, Macron could be forced to concentrate on managing a cordon sanitaire comprising those whose perspectives converge only on one issue: opposition to Le Pen. Second, the pressure to stop Le Pen could compel Macron to abandon bold reforms, rather than risk driving away more voters than he can afford to lose and opening the way for Le Pen and the National Front to strengthen their position. In Poland, reforms were realized despite politics, not thanks to politics. Rather than implementing an ambitious agenda, Tusk’s policy amounted to ‘keeping warm water in the taps.’ Macron could end up doing the same. Third, Macron could inadvertently help to bring the National Front to power. The existing political division between right and wrong, rather than between right and left, can become a self-fulfilling prophecy. Even the best politician is bound to make a mistake at some point, or simply to bore the electorate. If Le Pen remains Macron’s primary opponent, it is only a matter of time before she will reach for power as Kaczyński did, and ruin her country. Macron is thus both the bulwark against Le Pen and the guarantor of her success. Only a proper division into left and right can guarantee the survival of liberal democracy, as it gives voters multiple safe choices. But the elements of such a structure are possible only within a political community that enjoys economic sovereignty, and that will not be possible until we have political globalization. And everything comes full circle. To discern whether we are seeing the high tide or ebb tide of populism in Europe, the results of individual elections mean little. The focus must remain on the structural factors—above all, economic globalization in the absence of political globalization—underpinning the rise of populism. And in this regard, nothing has changed. Sławomir Sierakowski, founder of the Krytyka Polityczna movement, is Director of the Institute for Advanced Study in Warsaw. This article is presented in partnership with Project Syndicate © 2017. Image courtesy of Flickr French Embassy in the US.